Have you ever found yourself wondering what BMW stands for when shopping for a new luxury car or watching a BMW drive by on Ballwin roads? Wonder no more. BMW stands for Bayerische Motoren Werke, which is German for Bavarian Motor Works. The brand name is unique in German since the term Motorenwerke is normally supposed to be a single word instead of two. Learn more about the BMW name at BMW of West St Louis near Ladue, and contact us if you have any questions! How Did BMW Get Its Name? Founded by Karl Rapp in 1913, the Rapp Motorenwerke company manufactured aircraft engines in Munich, Germany. They officially changed the name to Bayerische Motoren Werke in 1917 when Karl Rapp left the company. “Bayerische” (Bavarian) indicates the company’s headquarters in Bavaria, a federal state in the southeastern part of Germany bordering Austria and the Czech Republic. The blue and white circular BMW logo was originally developed in 1917 and echoes the Bavarian flag, which is a blue and white checkered diamond pattern. The full name of the company is BMW AG. “AG” stands for Aktiengesellschaft, meaning an incorporation owned by shareholders. What is a Bimmer? What is a Beemer? “Beemer” and “Bimmer” are both slang for a BMW motorcycle or BMW automobile in English, although there are some disagreements about correct usage of the terms–some say that “Beemer” only refers to motorcycles and “Bimmer” only refers to cars, while Canadians tend to use “Bimmer” to mean both motorcycles and cars. What is the BMW Slogan? “The Ultimate Driving Machine” BMW slogan was originally used in North America in 1974 and was replaced temporarily in 2010 with the slogan “Joy.” The 1974 slogan made its return in 2012 and is still used to this day. 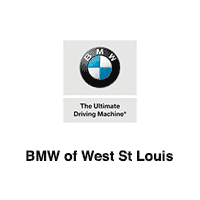 Learn more about the BMW brand at BMW of West St Louis to get ready for your next family trip to St. Louis, and experience The Ultimate Driving Machine in person by contacting us for a test drive near Des Peres!